They say that breaking up is hard to do, but breaking up lengthy articles is an easy way to maximize your writing ROI. Imagine you wrote a great 1,500 word article covering a number of different topics in your niche. You could just submit this long article as-is … or, you could break it up into three equally great articles of 500 words each. Doing this effectively triples the number of articles you submit (with the same amount of effort), which also triples your potential click-throughs! Trouble is, there are both good and bad ways to break up your long articles. BAD: Spread your long article out across multiple articles – This is a common, but rejectable, mistake when authors make top 10 lists (e.g. “Top 10 Ways to Improve Your Public Speaking – Part 1” with five of the ways, and “Top 10 Ways to Improve Your Public Speaking – Part 2” with the other five). Remember: Top 10 lists are only valuable if they actually contain 10 tips, and no one likes to see an article start with #6 and wonder where the first five might be hiding. The reason readers like top 10 lists is because they’re short, direct, and to the point. Either combine them into a single article or consider dividing the content up by topic. 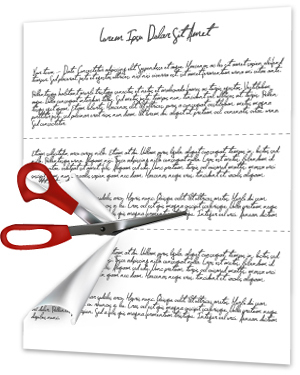 OKAY: Cut your article into pieces – The most obvious way to divide an article is just to cut that 1,500 word article into three equal pieces and label them Part 1, Part 2, and Part 3. But how effective is this? If a search engine brings readers to Part 2, they’ll feel they’re coming in at the middle of an article, and be annoyed at having to track down Parts 1 and 3. This is a poor user experience and can turn off readers to other articles written by you. GOOD: Arrange the information in such a way that you create three distinct articles that stand alone – For example, if your niche is weight loss methods, try composing one article that discusses diet, one that discusses exercise and one that discusses supplements. You’ll create three distinct articles, which won’t have the reader feeling he or she has missed out on anything. Plus, the increased specificity of the articles (and the keywords contained within) will drive more targeted traffic. In our “Top 10” example, if each of your 10 items is substantial enough to carry its own article, then do it. If not, simply don’t make a promise in the title that you can’t keep – just remove the words “top 10”. We highly recommend breaking up long articles into shorter article sets whenever possible. However, we don’t recommend doing it at the expense of the reader. If you have a long article that doesn’t lend itself well to being split up, then by all means keep it together. In the end, your readers, and your CTR, will love you for it. Try these techniques with your next long article and see how it works for you. You’ll find that breaking up can be pretty easy after all. I never realized that breaking up could be easy to do. :) Thanks for the good idea about breaking points up into categories to create multiple articles. These tips are excellent for the simple reason that they enable you to write more articles, instead of just the one. Building quality links is hard enough, and any extra help is much appreciated. Thanks Penny for the helpful hints. Lists, top 5s or whatever are always good, and as you say if you can expand on each tip, then you get more bangs for bucks! Thank you for the EzineArticles mug I received in the mail. I love it !!! Yes Christina, it can definitely be a difficult thing to figure out; the EzineArticles interface is crisp and very nice but it isnt always easy to decipher exactly what’s wrong when a red flag goes up. It is Splendid! A difficult task made so easy and ideally presented to educate even a layman.Wonderful.I love it too. Some goof tips, much appreciated. I currently have an article of weight loss tips that stands at nearly 7,000 words and I was struggling on how to submit it. Was going to to go for 2 * 3,500 words but after reading this post I think I’ll break it down into 10 * 700 words. 7,000 words!! You might want to think about writing an ebook instead and maybe selling it; then write adjunct articles to EzineArticles to promote the ebook. I would suggest going both routes; publish a condensed version of such a long article to the web, and promote it to gather interest. then approach a publisher with this already established platform about buying your novella or self-help book – whatever the subject. Very useful. I went the non-traditional route of setting up a sort of blogspot using EzineArticles, instead of first building a website and trying to direct traffic to the site. It can make for some very long articles, however, and it took me a while to figure out how to break them up without getting the “dont end articles abruptly” error lol.